At Prein&Newhof, we care about the water you drink and we know you do too. Know the facts: We’ve prepared some FAQs below about PFAS and lead as a first step and included a list of resources that we rely on. We can test your drinking water for lead and for PFAS at our Prein&Newhof Laboratory. We are overseeing the replacement of hundreds of lead service lines to homes in Michigan. Technology enables us to know more about our water today than ever before. With that knowledge comes the responsibility to solve new, complex problems. We accept that challenge. We want clean water too. What are Per- and Polyfluoroalkyl substances (PFAS) and why are they harmful? PFAS are a large group of man-made chemicals that are resistant to heat, water, and oil. For decades, they have been used in many industrial applications and consumer products such as carpeting, waterproof clothing, upholstery, food paper wrappings, fire-fighting foams, and metal plating. In 2012, six PFAS compounds were classified by the U.S. Environmental Protection Agency (EPA) as “emerging contaminants”. An emerging contaminant is not currently subject to any drinking water regulation, but is known or anticipated to occur in public water systems and thus may require regulation. Between 2013 and 2015 large water systems were required to monitor for these six PFAS under the Third Unregulated Contaminant Monitoring Rule (UCMR 3). Learn more about UCMR 3 here. What are the advisory levels? Prior to 2016, the EPA had advisory levels for two PFAS: perfluorooctanoic acid (PFOA) and perfluorooctane sulfonate (PFOS). The advisory levels for PFOA and PFOS were 400 parts per trillion (ppt) and 200 ppt, respectively. In 2016, the EPA set a lifetime health advisory (LHA) level for PFOA and PFOS at 70 parts per trillion (ppt), individually or combined. 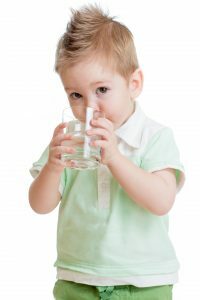 EPA’s health advisories are non-enforceable and non-regulatory and provide technical information to states agencies and other public health officials on health effects, analytical methodologies, and treatment technologies associated with drinking water contamination. The PFOA and PFOS LHA is the level set by the EPA to provide Americans, including the most sensitive populations, with a margin of protection from a lifetime of exposure to PFOA and PFOS from drinking water. How often is municipal water tested for PFAS? Large municipal water systems were required to monitor for six PFAS between 2013 and 2015 under the EPA’s UCMR 3. Since then, some water systems have proactively tested for PFOA and PFOS. In 2018, the Michigan Department of Environmental Quality (MDEQ) began a statewide program to test all community water systems and all schools that use well water for PFAS. The MDEQ sampling schedule and initial test results can be reviewed on the Michigan PFAS Action Response Team (MPART) website. How do I check if my home well water contains PFAS ? P&N has the capability to sample and test for PFAS. You can contact our Lab to get your home or water system tested. If your well does contain PFAS above the EPA health advisory level, you should contact your local county health department. Has the management of materials like PFAS been a part of Prein&Newhof’s work in developing water management systems? The U.S. Environmental Protection Agency has only classified PFAS as an emerging contaminant since 2013. We use the current state and federal regulations, as well as current engineering best practices, as we develop our plans. What experience does Prein &Newhof have in complex water safety issues? Since 1969, P&N has worked with municipal and private clients to address water quality, distribution, and discharge challenges, always with the public’s health as the top priority. What has changed with Michigan’s Lead & Copper Rule? The new Michigan Lead and Copper Rule was filed on June 14, 2018. Michigan now has the strictest regulations on lead contamination in the United States. According to this revised Rule, all water supply owners/operators are required to provide a preliminary inventory list of their drinking water systems by January 1, 2020. This means they must provide MDEQ with proper documentation identifying the location and material type of each water main and service lateral – and documenting the location of each lead service line. By January 1, 2025, they will be required to perform a verified inventory and provide the results to MDEQ. Water suppliers are required to notify their customers within 30 days of determining if a line has lead. The water supplier must also re-notify any future or new customers that move into that residence until the line is replaced. The new action level goes into effect in 2025, from 15 ppb to 12 ppb. An action level is the level of concentration of a harmful or toxic substance or contaminant that when exceeded, is considered sufficient to warrant regulatory or remedial action. We are working with Michigan’s municipal water suppliers to meet these requirements. If you are a homeowner, you may have a lead service line or a gooseneck/pigtail connected to galvanized pipe line which will need to be completely replaced. Goosenecks or pigtails (short sections of lead pipe) connected to a galvanized line make the entire service line be considered a lead service line. Additionally, any service lines that were previously connected to a gooseneck now need to have the rest of the line replaced. Will I have to pay for the replacement? No, your drinking water supplier is responsible for the entire water service line if it is a lead pipe – this encompasses from the watermain up to the 1st valve or 18” inside the building, whichever is closer to the watermain. If there is lead present in any area of the service line, it must be replaced. In addition, previous partial water service replacements must be revisited and partial lead service line replacements are no longer allowed. How do I check my home for lead? It’s easy! You can order a lead testing kit from our Environmental Laboratory. We are one of the few labs in West Michigan specializing in the analysis of drinking water samples. Prein&Newhof is Drinking Water Certified by the MDEQ for metals like lead, and many others. You can pick up a test kit or we can ship it to you. Call 616-364-7400 for details. What if I have lead pipe inside my home? It is your responsibility to replace all piping inside your home, beyond the water meter. Contact a licensed plumber to assist you if needed. What happens during and after a lead service line replacement? When replacing a lead service line, the supplier must notify the customer 45 days in advance. Once it is replaced, they must offer sampling, filters, flushing instructions, and educational material about lead in water. How can I stay up to date on my community’s water system? The new rule requires water systems serving more than 1,000 people to post updates and information on their website. They must also publish lead service line inventories (number of services, number of lead service lines) in their Annual Water Quality Report (aka Consumer Confidence Report, or CCR).